October is Breast Cancer Awareness Month. 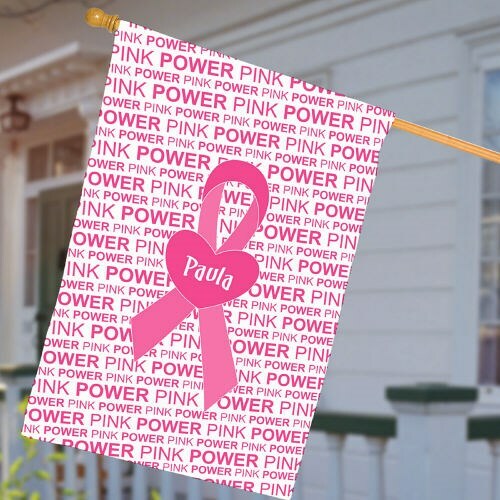 Decorate your home and promote awareness with our Personalized Breast Cancer Awareness House Flag. Our Personalized Pink Ribbon Flag is perfect to show your support for those fighting with this disease and in finding a cure. Your Personalized Awareness House Flag measures 29"w x 43"h. Includes FREE Personalization. Personalized with any name. (ie. Paula) Our house flags are just one of many great breast cancer awareness products that make it easy to show your support. Together we can fight the battle against Breast Cancer. Our Personalized gifts make great gifts for all occasions & now your gift goes even further. Purchasing a Personalized Breast Cancer Gift will now help the fight against Breast Cancer. We donate a portion of the proceeds to the fight against Breast Cancer. Also, take a look at our Personalized Breast Cancer Garden Flag. With this wonderful flag, you can display your support in your yard, garden and even next to your mailbox.